This project is the official iOS AAP for Zizhu Buddhist Temple, launch on the APP store On October 19th, 2012. As a famous ancient temple, Zizhu Temple has many believers around the world. The purpose or this APP is to introduce Zizhu Temple and Tibetan Buddhism traditional through the application, and allow Buddhist believers use this APP as a tool through recite scriptures and practice. The AAP includes functions of Prayer Wheel Blessing, Zizhu Profile, Scripture Reading, Zizhu Video, Buddhist Registration. 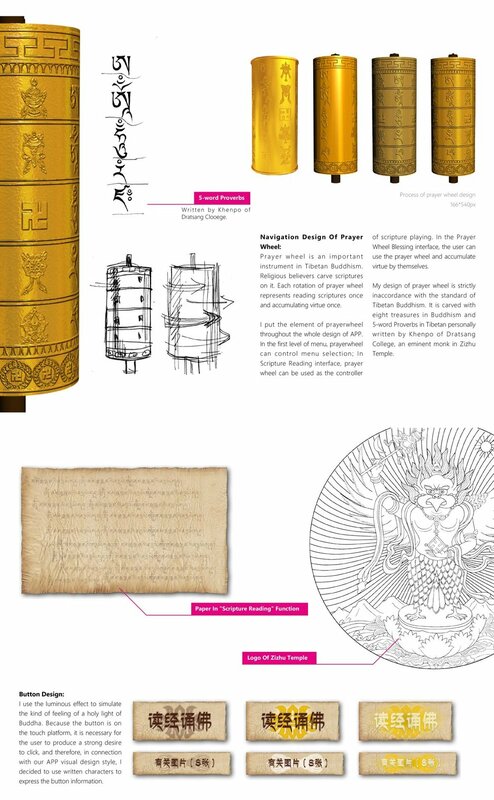 “Prayer wheel”, the important instrument in Tibetan Buddhism traditions, is used as menu design element creatively. It can help believers to study Buddhist scriptures and spray to accumulate virtue, which greatly enhances the user's experience of chanting and blessing. The App also provided online videos for user to study Buddhist from Masters in Zizhu temple. Finally, by providing rich contents of Zizhu Temple, “Zizhu Profile” can better introduce Zizhu Temple to people all around the world.